You know how a painting by Monet looks wonderful from far away, but up close it’s a mess? Well, that’s what my piece is like. This looks really good from a distance, but it’s a mess up close. 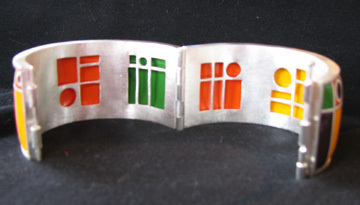 This bracelet was the most intense, hardest piece I’ve ever done so I guess I shouldn’t be too hard on myself. 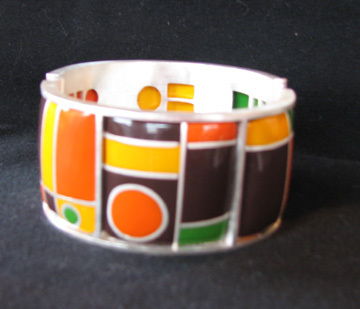 The bracelet is about 1 1/3″ tall and fits my wrist like a bangle. It has one hinge and a clasp that looks like a hinge, but you pull out a pin to open it. Let me know what you think and I’ll let you know if I get an A on it. Please forgive the fuzzy pics, I’m still trying to learn the new camera. Here’s the bracelet open. I do love the cutwork I did so the enamel would show through. Veerrry coool !!! Looks great, fuzzy photos and all. A fool and his Monet are soon parted. Buh! Very careful and intricate work! I can see it looking perfect with the right outfit. Where’s the mess? This is beautiful!! !